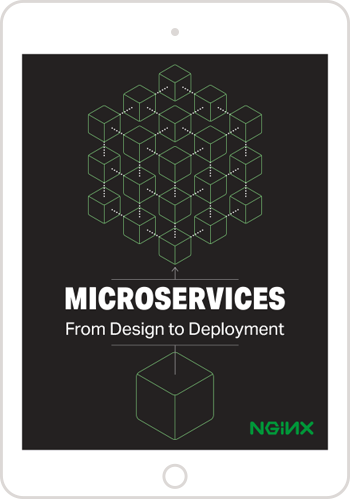 One of the great advantages of a microservices architecture is how quickly and easily you can scale service instances. With multiple service instances you need a load balancer and some way to quickly inform it of changes to the set of available service instances. This is known as service discovery. NGINX Plus provides two options for integrating with service discovery systems: the NGINX Plus API and Domain Name System (DNS) re‑resolution. This blog post focuses on the latter. When you scale service instances (we’ll call them backends in this blog post) by adding or removing virtual machines (VMs) or containers, the configuration of the load balancer must be changed to reflect every change to the set of backends. Scaling can occur multiple times per day, per hour, or even per minute, depending on the application. Given the high frequency of configuration changes, they need to be automated, and one of the ways to accomplish this is service discovery via DNS. Many platforms where you run your applications today, such as Kubernetes, support service discovery using DNS. We provide links at the end of this blog post to articles explaining how to integrate NGINX Plus with popular platforms and service discovery tools that use DNS. Before we explain how to configure service discovery via DNS, let’s take a quick look at some features of the DNS protocol that are particularly relevant or handy. By default, DNS clients and servers communicate over UDP, but if a domain name resolves to a large number of backend IP addresses, the complete response might not fit in a single UDP datagram, which is limited to 512 bytes. Using TCP instead of UDP solves this problem: when a full set of records doesn’t fit into one datagram, the server sets a truncation flag in its response, which tells the client to switch to TCP to get all the records. DNS over TCP is supported in NGINX version 1.9.11 and later, and NGINX Plus R9 and later. For more details, see Load Balancing DNS Traffic with NGINX and NGINX Plus on our blog. DNS resolves hostnames into IP addresses, but what about port numbers? There are some cases – for example, when load balancing Docker containers – where you cannot rely on well‑known port numbers, because port numbers are dynamically assigned instead. DNS has a special type of record – the Service (SRV) record – that includes port numbers and a few other parameters. In R9 and later, NGINX Plus supports SRV records (and so can extract port information from them). Editor – For an overview of all the new features in NGINX Plus R9, see Announcing NGINX Plus R9 on our blog. Now we’ll show you five ways to use DNS for service discovery in NGINX and NGINX Plus, in order of increasing sophistication. The first three are available in both NGINX and NGINX Plus, and the last two in NGINX Plus only. In this survey of service‑discovery methods, we’ll assume we have an authoritative name server for the zone example.com, with IP address 10.0.0.2. There are three backend servers that correspond to the domain name backends.example.com, as shown in the following output from the nslookup utility. With the first four methods we’ll discuss, NGINX and NGINX Plus request standard A records from DNS; with the final method, NGINX Plus requests SRV records instead. We’ll start with showing you the three ways to use DNS with NGINX Open Source (as we mentioned above, you can also use them with NGINX Plus). As NGINX starts up or reloads its configuration, it queries a DNS server to resolve backends.example.com. The DNS server returns the list of three backends discussed above, and NGINX uses the default Round Robin algorithm to load balance requests among them. NGINX chooses the DNS server from the OS configuration file /etc/resolv.conf. If the domain name can’t be resolved, NGINX fails to start or reload its configuration. NGINX caches the DNS records until the next restart or configuration reload, ignoring the records’ TTL values. We can’t specify another load‑balancing algorithm, nor can we configure passive health checks or other features defined by parameters to the server directive, which we’ll describe in the next section. To take advantage of the load‑balancing options NGINX provides, you can define the group of upstream servers in the upstream configuration block. But instead of identifying individual servers by IP address, use the domain name as the parameter to the server directive. As with the first method, backends.example.com gets resolved into three backend servers as NGINX starts or reloads its configuration. But now we can define a more sophisticated load‑balancing algorithm, Least Connections, and use the max_fails parameter to enable passive health checks, specifying that NGINX marks a server as down when three consecutive requests fail. Though this method enables us to choose the load‑balancing algorithm and configure health checks, it still has the same drawbacks with respect to start, reload, and TTL as the previous method. When you use a variable to specify the domain name in the proxy_pass directive, NGINX re‑resolves the domain name when its TTL expires. You must include the resolver directive to explicitly specify the name server (NGINX does not refer to /etc/resolv.conf as in the first two methods). By including the valid parameter to the resolver directive, you can tell NGINX to ignore the TTL and re‑resolve names at a specified frequency instead. Here we tell NGINX to re‑resolve names every 10 seconds. Note: For TCP/UDP load balancing, this method of using a variable in the proxy_pass directive is supported in NGINX 1.11.3 and later, and NGINX Plus R10 and later. This method eliminates two drawbacks of the first method, in that the NGINX startup or reload operation doesn’t fail when the domain name can’t be resolved, and we can control how often NGINX re‑resolves the name. However, because it doesn’t use an upstream group, you can’t specify the load‑balancing algorithm or other parameters to the server directive (as we did in the second method). Now we’ll look at the two methods for service discovery with DNS that are exclusive to NGINX Plus. Include the resolver directive to specify the name server, as in the previous method. Include the zone directive in the upstream configuration block to allocate a shared‑memory zone. Add the resolve parameter to the server directive where we use the domain name. By default, NGINX Plus honors the TTL, re‑resolving names when records expire. To have NGINX Plus instead re‑resolve names at a specified frequency, include the valid parameter to the resolver directive. In the snippet, every 10 seconds NGINX Plus queries the name server at 10.0.0.2 to resolve backends.example.com. If the name can’t be resolved, NGINX Plus doesn’t fail, either at start up, when reloading the configuration, or during runtime. Instead, the client sees the standard 502 error page. NGINX Plus R9 and later supports DNS SRV records. This enables NGINX Plus to get not only IP addresses from a name server, but also port numbers, weights, and priorities. This is critical in microservices environments where the port numbers of services are often dynamically assigned. _http._tcp.backends.example.com	service = 0 2 8090 backend-0.example.com. _http._tcp.backends.example.com	service = 0 1 8091 backend-1.example.com. _http._tcp.backends.example.com	service = 10 1 8092 backend-2.example.com. _http._tcp. – The name and the protocol of the SRV record. We’ll specify this as the value of the service parameter to the server directive in the NGINX Plus configuration file (see below). 0 – The priority. The lower the value, the higher the priority. NGINX Plus designates servers with the highest priority as primary servers, and the rest of the servers as backup servers. This record has the lowest value (the highest priority) among all records, so NGINX Plus designates the corresponding backend as a primary server. 2 – The weight. NGINX Plus sets the backend’s weight to this value as it adds the backend to the upstream group (equivalent to the weight parameter on the server directive). 8090 – The port number. NGINX Plus sets the backend’s port to this value as it adds the backend to the upstream group. backend‑0.example.com – The hostname of the backend server. NGINX Plus resolves this name and adds the corresponding backend to the upstream group. If the name resolves to multiple records, NGINX Plus adds multiple servers. Using the service parameter to the server directive, we specify the name and the protocol of SRV records we wish to resolve. In our case they are _http and _tcp respectively. Apart from the service parameter and the fact that we don’t specify a port, it looks the same as the configuration example from the previous section. 10.0.0.10 – Primary server with port 8090 and weight 2. 10.0.0.11 – Primary server with port 8091 and weight 1. 10.0.0.12 – Backup server with port 8092 and weight 1. Note how requests are distributed according to the specified weights. The 10.0.0.11:8091 server (with weight 1) gets one‑third of the requests, while the 10.0.0.10:8090 server (with weight 2) gets two‑thirds. 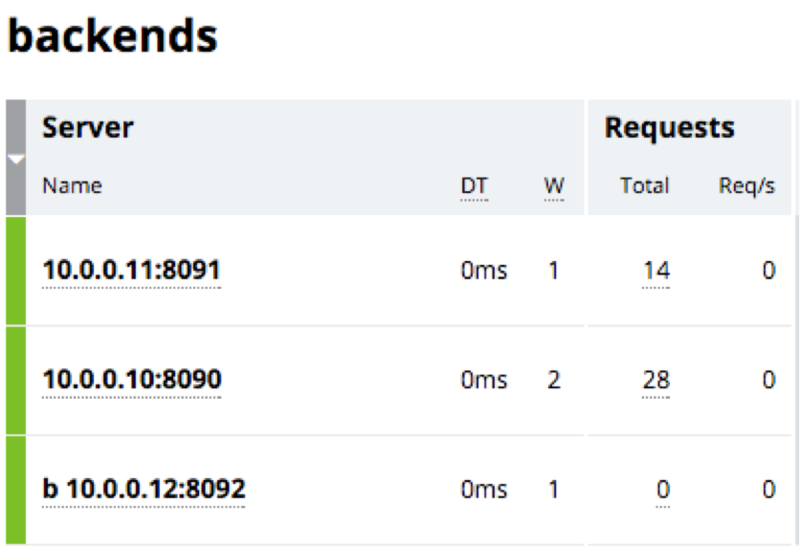 As a backup server, the 10.0.0.12:8092 server doesn’t get any requests unless the other two servers are down. The DNS server either needs to be highly available or have a backup server. If the DNS server becomes unavailable, NGINX Plus stops getting updates. It keeps the existing backends in the configuration (unless you restart it or reload the configuration), ignoring the TTL values of the corresponding records. You can specify multiple name servers with the resolver directive, so that if one of them is down, NGINX Plus tries the others. As mentioned in the introduction, an alternative to DNS for service discovery with NGINX Plus is the NGINX Plus API, which enables you to make simple HTTP requests to add or remove servers in an upstream group. We&’ll update this list as we write more about new integration options in the future. Service discovery via DNS, fully available in NGINX Plus, provides a simple way to update the configuration of the load balancer in a microservices environment. Support for SRV records in Release 9 and later makes NGINX Plus even more powerful, as it lets NGINX Plus get not only IP addresses, but also port numbers of backends. Ready to try out service discovery with DNS for NGINX Plus, along with its other enhanced features? Start your free 30-day trial today or contact us to discuss your use cases.